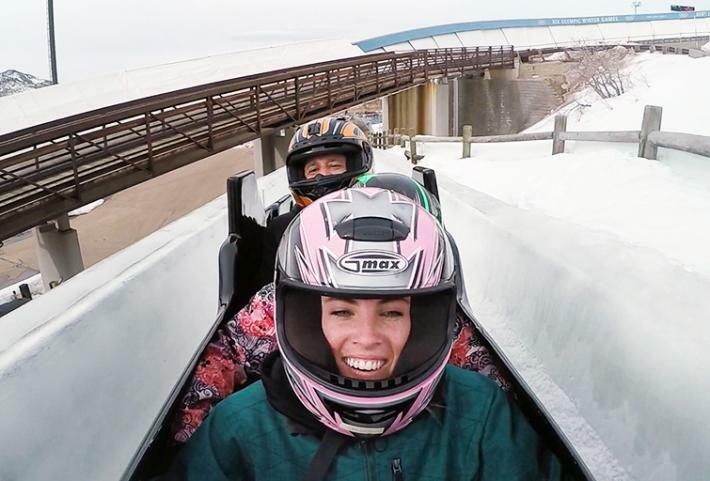 Just outside of downtown Park City, at 7,300 ft. elevation, the Utah Olympic Park still buzzes with excitement and enthusiasm that one might have expected 15 years ago when the Park hosted five events during the Salt Lake 2002 Olympic Winter Games: bobsled, skeleton, luge, and the Nordic combined events. During that time though, the Park looked much different than it does today. Hundreds of media vans, buses, and semi-trailers filled the parking lots where dozens of nations broadcast race results across the globe of their athlete&apos;s success’ and frustrations. Fans from around the world crowded the mountainside to cheer and support their nations and compatriots. And although the two weeks of those games have long passed, the exhilaration of those sports is still electric in the brisk mountain air. Today, where all those media and equipment vehicles parked stands a beautiful glass building, the Joe Quinney Winter Sports Center. Inside is a gift shop boasting collectibles and memorabilia from the games and the Alf Engen Ski Museum that traces the history of winter sports in Park City. Full-body ski suits from decades past stand like colorful sentinels against the wall. Looping videos explain the quality of snow, the formation of ice crystals, and pressing environmental issues. The second floor of the museum pays homage specifically to the Salt Lake 2002 Olympic Winter Games where sections of the massive floats and brilliant, iridescent costumes used in the Opening Ceremony still hang on the walls. The space is beautifully curated and frequently updated with funds from grants and donations. This attraction is free to the public and as a non-profit organization, each year hundreds of fourth-graders are bused up to the Park to learn about the legacy of the Olympics and winter sports. Carved into the hill to the west is the granddaddy of them all: the bobsled track. 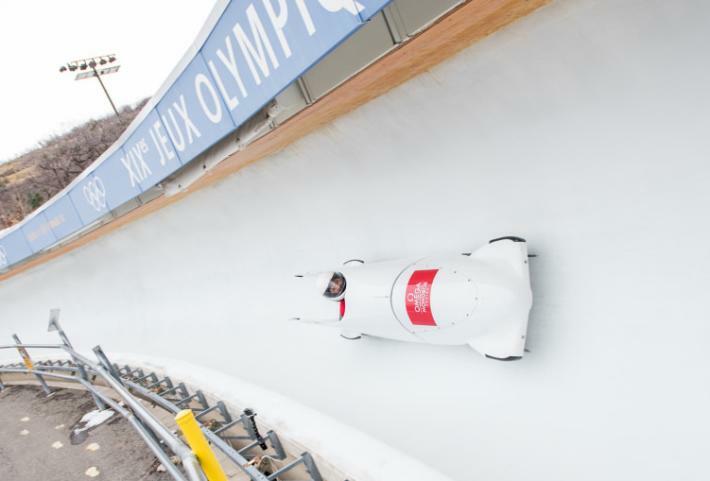 The track is 1,335 meters of pure, icy exhilaration with over 15 turns and 103 feet of vertical drop. This incredible track is maintained with 54 miles of piping and 110,000 pounds of refrigeration to keep the track at -14 F during the winter. In the cold months visitors can ride three at a time with a professional driver down the track. You can also experience the track in the summer when the it is defrosted and the sleds are equipped with wheels. Ripping down the track at 70+ mph, screams of terror and joy echo through the Park. While some of these attractions are available by purchasing a day pass, the entire Park is open to the public to roam and wander the grounds, reliving the Olympic experience. 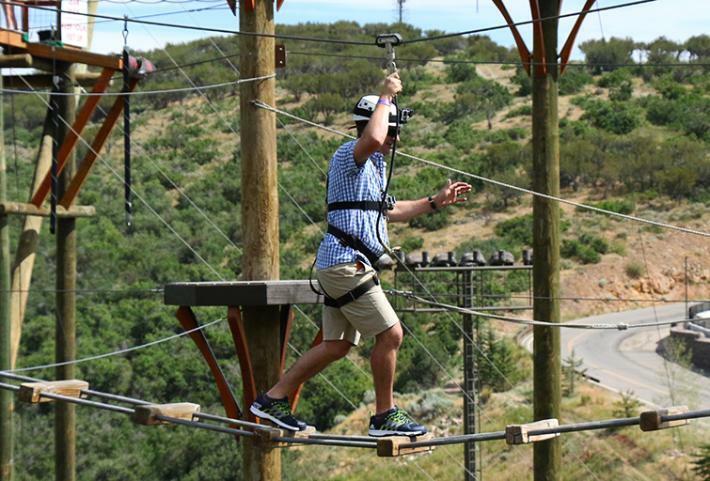 When you visit the Utah Olympic Park there are numerous activities to experience that will fill your day with fun and excitement. There are banquets and venues available for corporate events, private parties, family reunions, and so on. The Park is educational and entertaining, for everyone in the family. But what still resides at the Park, and what you’ll leave with despite what activities you choose to enjoy, is the spirit of the 2002 Olympic Winter Games. The motto for those games was Light the Fire Within, and that flame still burns bright, fifteen years later. If you want to really up the excitement you can buy a day pass and expand the experience, and up the adrenaline, with more activities. When the Nordic jump isn’t being used for practice, dozens of tubers race down the massive, steep landing zone and skim to a stop on the grass. Above them, four zip lines send visitors squealing down the mountainside two-by-two experiencing the same view as an Olympic Nordic jumper. If poise and agility is more your game, near the landing zone is one of the two ropes courses where you can test your mettle against heights and balance. As you exit the museum through the café, you might want to grab some hot cocoa and a snack as you sit on the balcony and watch national ski teams from around the world practice on the Nordic and aerial jumps. Olympic athletes spin thirty and forty feet in the air and splash land into a pool as they train during the off-season for their events. Their coaches call out instructions from the sidelines in numerous different languages and one can’t help but feel transported to the world community of the Games. A recently-added slope-style jump attracts talented athletes in both snowboarding and skiing where they launch into the air spinning and flipping and land into a massive inflatable pad, one of the largest of its kind. Keep exploring and find the Discovery Zone where youngsters can swing from ropes and maneuver through nets and suspended wires. Or bring your bike to the Park and traverse the miles of hiking and biking trails surrounding the Park and get a view of the bobsled track from above. All of these events are free to the public and make for a day of non-stop fun.